The Elite Trampoline Academy is a trampoline training facility fully equipped with 9 trampolines devoted to bringing you the highest level of the world's newest and most exciting Olympic sport! Along with our internationally recognized competitive team, we offer recreational trampoline lessons for children of all ages and adults. Our recreational lessons create a unique and fun way to burn calories and stay in shape. Looking for the newest and most cutting edge place to host your child's birthday party? Look no further -- the Elite Trampoline Academy is Monmouth county's hottest new place to celebrate a birthday! Come bounce around in one of our Open Gyms, practice some of your cheerleading jumps, or use our awesome tumbling floor. 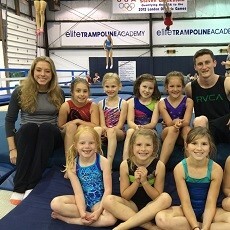 The Elite Trampoline Academy has something for everyone!